Juicy, crunchy, sweet or sour, red, green or yellow – the South Tyrolean apples are as varied as the region in which they grow. But they have one thing in common: they are very healthy! “An apple a day keeps the doctor away!” Being real vitamin bombs is just one of the many reasons to occupy one´s mind with this delicious South Tyrolean fruit. The South Tyrolean apple is part of many menus at the Dolce Vita Hotels’ restaurants. Did you know that every tenth apple harvested in Europe is grown in South Tyrol and that apples are real mood lifters? Eating South Tyrolean apples supplies your blood with more oxygen and you instantly feel fresher and more energetic. The South Tyrolean apples are only harvested when ripe and full of vitamins and minerals. Apples from overseas cannot compete with that because they mostly ripen on the ship which transports them to Europe. If you would put all the apples harvested in South Tyrol on top of each other, then the chain of apples would reach the moon. The Vinschgau District’s mild climate promotes an early bloom and with that a spectacle for the senses. A white veil covers South Tyrol and a wonderful fragrance breezes through the valley while icy temperatures still embrace the mountain peaks. The apple growers spray the blossoms with water should a late cold spell occur. The water turns into a protective coat of ice during the night. The first rays of sunshine melt the ice in the morning and the whole of the Vinschgau District glistens and sparkles in the sun. The cultivation of apples has a centuries-old tradition in South Tyrol. Apples from South Tyrol: quality you can taste. Has this made you want to bite in a crunchy South Tyrolean apple? Do you want to watch experienced apple growers during harvest? 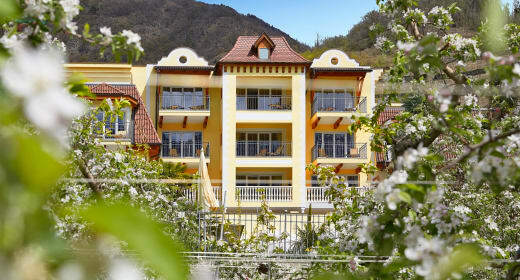 The Dolce Vita Hotels offer tours to the fruit growers’ collectives every week. All Dolce Vita Hotels are located in the heart of the apple paradise - Naturns and Latsch near Merano: best to send a non-binding booking inquiry for your Dolce Vita room in South Tyrol’s kingdom of apples now.